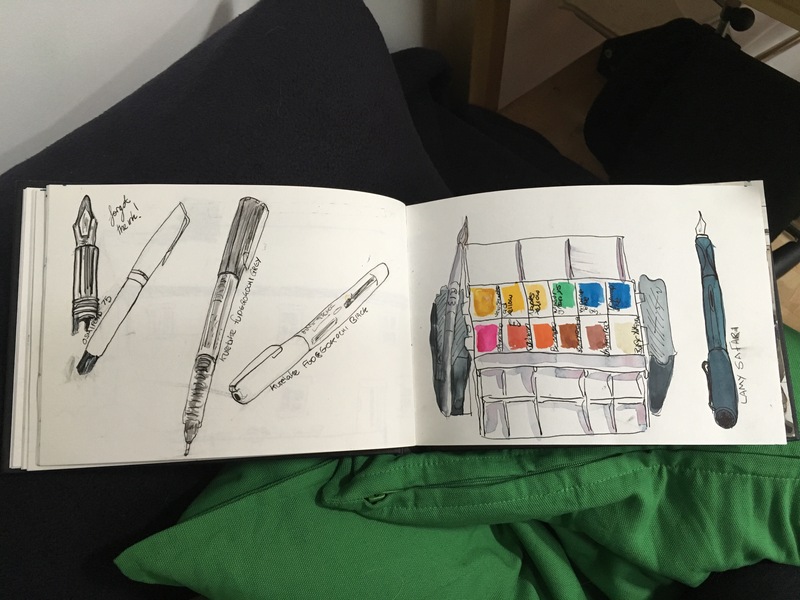 I’ve just been away to London for three days and I took some sketching implements with me. As a follower of Liz Steel, Teoh Yi Chie and Path Southern Pierce (warning, you’ll walk away with a new foundation pen and a portable palette) I gathered up my materials and decided i would make use of the train ride down to sketch my materials. I got to drawing my foundtain pen and was to travel sick to continue. And spent the rest of the journey breathing deeply with closed eyes. Oh well. Let that be a lesson. Trying to power on through travel sickness leaves some terrible perspective mistakes. But once in the hotel room it gave me something to noodle away at while we had a restrictive cup of tea before hitting our first art gallery. Here are my two Kuretake Fudegokochi pens in grey and black, portable painter palette with my Rosemary’s and co portable sable round paintbrush and the two foundtain pens I took: Lamy Safari fountain pen with noodlers bullet proof ink and old Osmipoid 75 with a sketching nib (and I forgot to refill it with ink….!). Bottom row left to right: DS Opera Rose, W&N Cadmium Red, DS Perinone Orange, SAA Burnt Sienna, W&N Indian Red, DS Buff Titanium. Top Row: W&N New Gamboge, W&N Cadmium Yellow, W&N Naples Yellow, W&N Winsor Green Yellow Shade, W&N Winsor Blue Green Shade and SAA Tropical Blue. 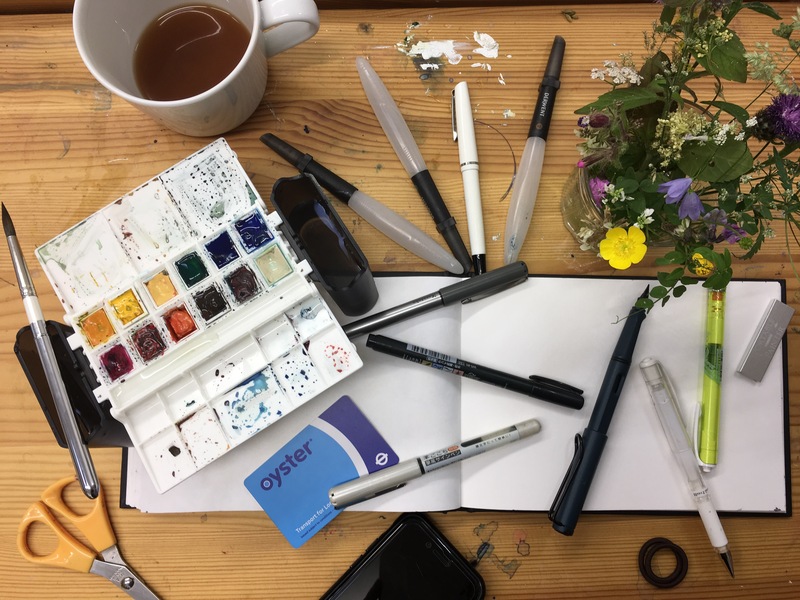 Other items I took but didn’t make it into the sketch: 3 derwent water brushes (never used – the portable palette has inbuilt water pots), uni kuru toga mechanical pencil (so i didn’t have to carry a sharpener), tombow calligraphy pen and a uni-ball signo broad white gel pen. take a tube of white gouache or a white acrylic marker for correcting mistakes/adding highlights instead of the white gel pen as even though it’s just my sketch book, I don’t want it to flake off later. Also found it painted over in interesting ways. Which does lend a nice sketchy detail to the piece, just not what I aiming for at the time. 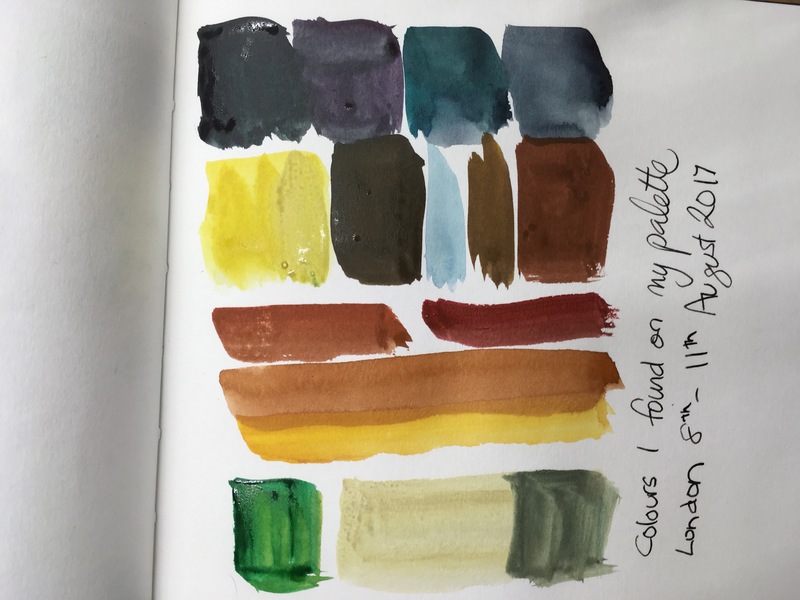 I fully intended to do more colour swatching, but due to travel sickness then being on the go I have one and a half sketches to share with you. Both where started on location, along with people sitting outside in front of my view facing me so I spent a lot of time trying not to be caught staring at them and measuring the size of their heads. I started it while we where having a cup of tea and waiting for my cousin to finish work as we where going out for dinner so finished it off over the next couple of days from photos. 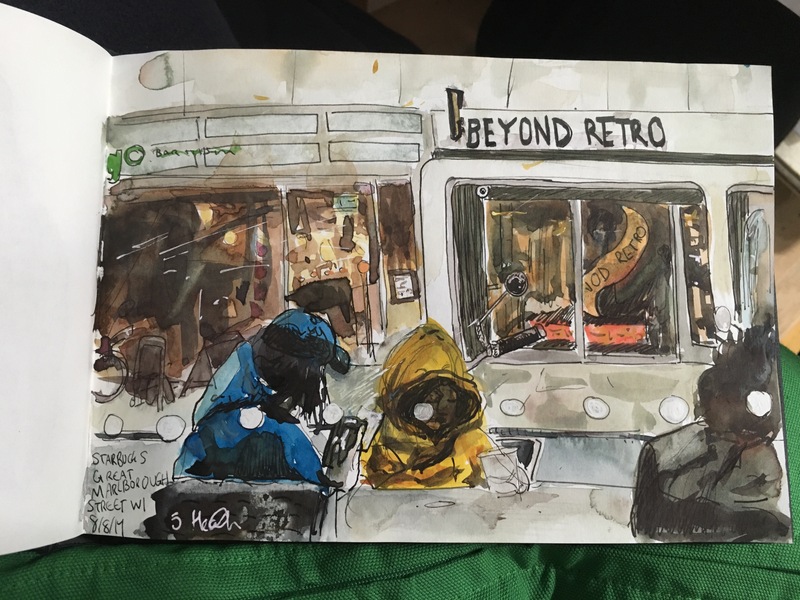 Sitting inside Starbucks, three smokers went and sat outside so I added them to the sketch. 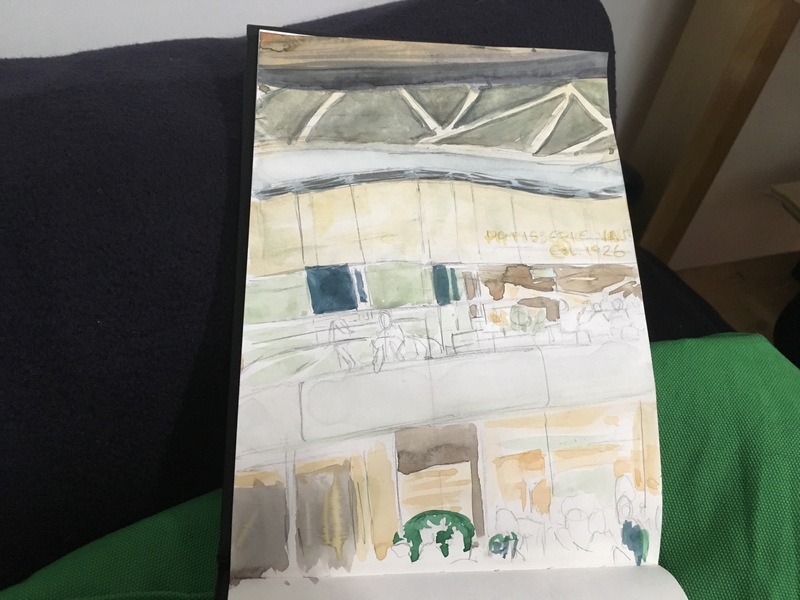 Very quick sketch of Kings Cross Station from Leon’s looking at Starbucks and PATISSERIE Var…. something or other. I did add a few washes of colour on the train, but trying to paint precise lines in motion was interesting. I was also very inspired buy the john Singer-Sargent watercolour exhibition we had seen and how he would select the ‘Gondela view’ aka the bottom of monuments and other places of interest to paint, often leaving the people as suggestive sketches so I don’t know if I’ll do anymore to this. And last but not least: my colour palette of London. (Inspired by Parkablogs review of Local Colour) and Liz Steels colours of Chicago.